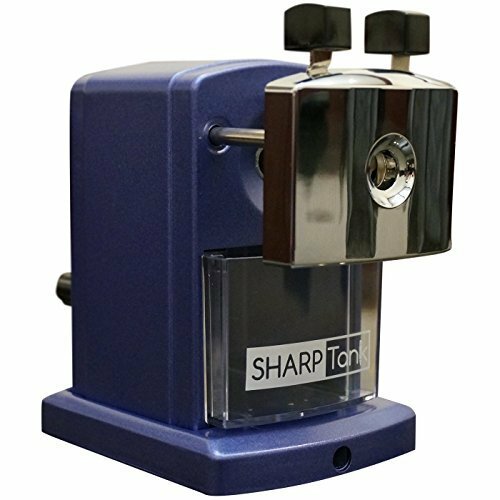 SharpTank Portable Pencil Sharpener (Metallic Plum) | Compact & Quiet Classroom Sharpener That Gets Straight to the Point! Is it possible to fall in love with a sharpener? We think so! Experience the SharpTank and enjoy the simple pleasure of producing a perfectly sharpened pencil. It is teacher tested - a favorite of kids and schools across the USA. The SharpTank is the perfect pencil sharpener for for classroom use. A top choice of teachers, kids, and artists. It is a q-u-i-e-t sharpener - no more noisy interruptions as students are sharpen pencils at school. It has a durable, heavy-duty design. The SharpTank includes an all-metal handle, sturdy metal body, and sharp rotary tool good for up to 5000 uses. You will get years of use out of this sharpener. It will outlast electric and automatic sharpeners. It works well with standard and colored pencils making it a great choice for aspiring artists. The compact design makes this the ideal sharpener for classroom and office settings. The helical blade is quiet and easily removed for cleaning. Perfect for your arts and crafts shelf (or art table). It will NOT over-sharpen pencils. The Sharp Tank’s tension springs draw the pencil into the cutting chamber producing a perfect point. Once the pencil is sharp the machine’s unique design will not allow it to “over sharpen” a pencil--giving you a perfect point. Click “Add to Cart” and “Proceed to Checkout” in order to receive you SharpTank right away. IS IT POSSIBLE TO FALL IN LOVE WITH A PENCIL SHARPENER? WE THINK SO! Experience the SharpTank and enjoy the simple pleasure of producing a perfectly sharpened pencil every time. Teacher tested - a favorite of kids and schools across the USA. DURABLE, HEAVY-DUTY DESIGN: Beware of cheap imitations, the SharpTank will last; This attractive portable pencil sharpener is made with an all-metal handle, sturdy metal body, and sharp rotary tool good for up to 5000 uses; This heavy duty sharpener has been put to the test in classrooms and offices across the USA and is a top choice of teachers, kids, and artists. THE COMPACT QUIET DESIGN makes this the ideal sharpener for classroom and office settings. The helical blade is quiet and easily removed for cleaning. A great tool for your arts and crafts shelf (or art table). Artists who enjoy drawing, sketching, or even adult coloring books will appreciate the fine point it produces; The Sharpener works with colored pencils and drawing pencils with softer leads. Colored pencils do not damage the cutting blade. IT WILL NOT OVER-SHARPEN PENCILS - The Sharp Tank's tension springs automatically draw the pencil into the cutting chamber producing a perfect point. Once the pencil is sharp the machine's unique design will not allow it to "over sharpen" a pencil--giving you a perfect point every time. If you have any questions about this product by SharpTank, contact us by completing and submitting the form below. If you are looking for a specif part number, please include it with your message.